The "old" world order is based upon the father's/Father's authority, with children having to humble, deny, die to their "self" in order to do right and not wrong according to established commands, rules, facts, and truth, engendering a guilty conscience for doing wrong, disobeying, sinning in the process. The "new" world order is based upon the carnal nature of the child, i.e., the child's love of pleasure and hate of restraint, with "group psychotherapists," i.e., facilitators of 'change,' i.e., Transformational Marxists, as pimps and pedophiles, seducing, deceiving, and manipulating men, women, and children, using them as "human resource" for their own pleasure and gain—doing so in the name of "the children," i.e. in the name of "the people." While those of the "old" world order 1) preach commands and rules to be obeyed as give, teach facts and truth to be accepted as is (by faith), discuss (at their discretion) any questions those under authority might have (if time permits, they are able to understand, and are not challenging or questioning authority), 2) bless or reward those who obey or do things right, 3) chasten or do not reward those who disobey or do things wrong, and 4) cast out or reject those who question, challenge, defy, disregard, attack their authority—thereby preventing, i.e., inhibiting or blocking the formation of the "new" world order—those of the "new" world order dialogue opinions to a consensus (there is no father's/Father's authority in dialogue, opinions, or consensus), affectively negating the "old" world order, i.e., the father's/Father's authority in the thoughts and actions of the children, negating their having a guilty conscience for doing wrong, disobeying, sinning in the process—so those of the "new" world order can do wrong, disobey, sin with impunity. The "group grade," i.e., "safe zone/space/place," i.e., "be positive, not negative," "snowflake creating," i.e., soviet, i.e., brainwashing classroom (for all ages, vocations, professions, and offices) has been at the forefront of this so called paradigm 'shift.' This also applies to the "church." If you think of why a person responds the way they do in a given situation, order depends upon whether they are being directed according to internal or external forces (subjective or objective) or the combination of the two. Is order subjective, i.e., internal, i.e., based upon a person's "feelings" of the 'moment,' in the "light" of the given situation, or objective, i.e., external, i.e., based upon established commands, rules, facts, truth? The structure or system of the father vs. the structure or system of the child is at the heart of the issue. It directly affects you, how you respond to your "self," to others, to the world, and to authority. Without understanding these differences you can not understand what is happening to you, your spouse, your children, your friends (and enemies) and the world you live in, i.e., you can not properly understand the books you read, the news you listen to, nor the conversation you have with your "self" or with others. The so called "'old' world order" or system is "top-down," "doing right and not wrong," i.e., is based upon the father's/Father's authority where the father/Father 1) gives his children commands and rules to be obeyed, as given, and facts and truth to be accepted as is, by faith, discussing (at his/His discretion) any questions regarding what to do or how best to do the job at hand 2) rewards or blesses those who obey and/or do things right, 3) chastens or corrects those who disobey and/or do things wrong, so they might learn to obey and/or do what is right, and 4) casts out any who reject all the above, i.e., who questions, challenges, defies, disregards, attacks, etc., his/His authority. This is the order of the "'old' world order" where "doing right and not wrong," according to the father's/Father's standards, i.e., doing the father's/father's will is the 'purpose' of life. "Be ye therefore perfect, even as your Father which is in heaven is perfect." Matthew 5:48 As the laws of nature are established by God so are God's laws regarding how man is to think and act. Only, in the latter, man has failed the standard. "For all have sinned, and come short of the glory of God;" Romans 3:23 It is the father's/Father's love that resolves the dilemma, with the earthly father forgiving the child when he repents, and the Heavenly Father redeeming man from damnation by the work of his Son, covering our sins by his shed blood on the cross, reconciling him to Himself by his work on the Son, i.e., raising him from the grave. "Being justified freely by his grace through the redemption that is in Christ Jesus: Whom God hath set forth to be a propitiation through faith in his blood, to declare his righteousness for the remission of sins that are past, through the forbearance of God; To declare, I say, at this time his righteousness: that he might be just, and the justifier of him which believeth in Jesus." Romans 3:24-26 "For by grace are ye saved through faith; and that not of yourselves: it is the gift of God: Not of works, lest any man should boast." Ephesians 2:8, 9 In this order each child/man is recognized as an individual—being held personally accountable for his thoughts and behavior, not only toward the father/Father and his/His authority but toward the other children and the world as well. In doing so he learns to humble, deny, die to, control, discipline his "self" in order, as in "'old' world order" ("old school") to do "right and not wrong," according to his father's/Father's will. "The heart is deceitful above all things [thinking pleasure is the standard for "good" instead of doing the father's/Father's will], and desperately wicked [hating whoever prevents it from enjoying the carnal pleasures of the 'moment' it desires]: who can know it?" Jeremiah 17:9 You can not see your hate as being evil, with "self," i.e., your love of pleasure standing in the way, 'justifying' your hate as being justified. What Hegel, Marx, and Freud had in common was the 'liberation' of the child's carnal nature and the negation of the father's/Father's authority, creating a "'new' world order" with them in control—establishing the child's carnal nature over and therefore against the father's/Father's authority, i.e., the "'old' world order" with its restraints, negating the guilty conscience for doing wrong, disobeying, sinning in the process, so they could do wrong, disobey, sin with impunity. The so called "'new' world order" had its beginning in the garden in Eden (Genesis 3:1-6 ) where the master facilitator of 'change,' i.e., the master psychotherapist came between two "children" and the "Father" (regarding systems or paradigms), 'liberating' the "children" from the Father's authority (Hebrews 12:5-11), negating the guilty conscience for doing wrong, disobeying, sinning, negating man's need to repent before the father/Father in the process (Romans 7:14-25). You persuade people with facts and truth while you seduce, deceive, and manipulate people with "feelings." The Patriarchal paradigm (a paradigm is the way a person feels, thinks, and acts, as well a relates to "self," others, and the world, as well as responds to authority) requires the person to humble, deny, die to, control, discipline his "self" in order to "do right and not wrong" according to standards established by authority. The Matriarchal paradigm is when "feelings" become the 'driving' force of a persons way of thinking and acting, where "self" finds more freedom from the father's authority. The Heresiarchal paradigm (of 'change') requires the "feelings" of "belongingness" to move the person away from the Patriarchal paradigm to its way of thinking and acting. To accomplish this the person must be given freedom to share his desires (those which are restrained by authority) without fear of restraint, while gaining approval by "the group," thus moving him away from 'loyalty' to authority to loyalty to "the group," where he finds common identity based upon "feelings," both his and theirs. Both "feelings" 1) for the carnal pleasures of the 'moment' (which the person desires) and resentment toward restraint (and the restrainer) and "feelings" 2) for approval (affirmation) from others (with similar desires and resentment) 'change' his paradigm, i.e., change his way of thinking and acting—from evaluating the immediate situation from commands, rules, facts, and truth he has learned in the past to evaluating commands, rules, facts, and truth from his carnal "feelings" of the 'moment,' which are being stimulated by the immediate situation, with the information he is receiving in the 'moment' "helping" him determine the proper action to be taken. It is the affect of affirmation, i.e., "group dynamics," i.e., the child's natural desire for approval from others, especially those he "likes," i.e., who make him "feel" good or he has "need" of, along with their approve of his resentment toward authority (which is preventing him from having what he wants) that locks in his 'loyalty' to "the group," and the one initiating and sustaining its actions, i.e., the facilitator of 'change,' the initiator and sustainer of the process of 'change'—"suggesting" and "approving" "appropriate information," i.e., "feelings" or "opinion" based questions and answers that will guarantee his objective, i.e., affirmation, "disapproving," "disregarding," or "excluding" "inappropriate information," i.e., commands, rules, facts, and truth that will prevent it, i.e., that cause division. It is the 'change' agent's "duty," through the use of "force field analysis," to identify the different "forces" or paradigms in the meeting (from the Patriarchal to the Heresiarchal paradigm) and "unfreeze" all participants (by 1. resisting any who are "negative," i.e., who are of and for the Patriarchal paradigm, i.e., "judgmental," "prejudiced," demanding an either-or, right-wrong, above-below outcome, and 2. asking all to be "positive," i.e., to set aside, i.e., suspend "for the 'moment,'" as on a cross any command, rule, fact, or truth that "hurts" peoples "feelings"), "move" all participants (by "encouraging" everyone to dialogue their opinions, which automatically negates the father's/Father's authority, i.e., the Patriarchal paradigm), and "refreeze" all participants (by bringing them to a consensus, i.e., to a "feeling" of "oneness" in solving a problem—void of the father's/Father's authority, i.e., void of the Patriarchal paradigm influencing and/or controlling the outcome). (Kurt Lewin) Simply put: the Patriarchal paradigm is negated in the dialoguing of opinions to a consensus meeting. The Heresiarchal paradigm is negated in the preaching of commands and rules to be obeyed as given, the teaching of facts and truth to be accepted as is, by faith, and discussion (at the one in authorities discretion).Whoever leads the meeting, be it in the classroom, the workplace, the town hall meeting, etc., determines the outcome, whether it will be of and for the "old" world order or the "new." 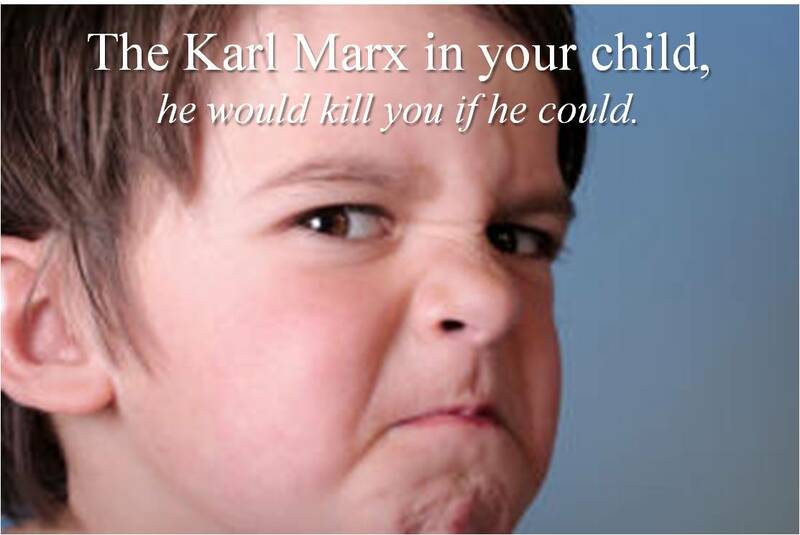 By merging Marx and Freud, i.e., social ("the group") and the individual, creating "group psychotherapy," children (along with their parents, if they participate), in a facilitated meeting, are able to dialogue their opinions to a consensus, negating the father's/Father's authority and the guilty conscience for doing wrong, disobeying, sinning in the process, 'creating' a "'new' world order" of perpetual 'change.' While Traditional Marxist's used the father's/Father's authority system of force in order to kill the fathers in society (allowing the father's/Father's authority to remain in tack in the next generation of citizens, i.e., in the children), Transformational Marxists, social-psychologist's, "group psychotherapist's," facilitator's of 'change' (all being the same), kill the father's/Father's authority in the children, 'creating' a "new" world order with them in charge—treating men, women, and children as natural resource, living off of them as pimps and pedophiles, using them for their own pleasure and gain without having a guilty conscience. Another article regarding The difference between the old and new world order. In review: the "new" world order is 'driven' by the carnal nature of the child, i.e., the child's natural love of pleasure and hate of restraint and is 'purposed' in augmenting pleasure and attenuating "pain," i.e., negating the father's/Father's authority. The "old" world order is build upon faith and obedience, i.e., the people respecting, honoring, supporting, and defending the father's/Father's authority over his/His children. While the Son came to 'redeem' man from the Father's wrath upon them for their sins (disobedience), 'reconciling them to His Father, those of the "new" world order seek to 'redeem' man from the Father, 'reconciling' them to the world instead, so they can do wrong, disobey, sin without having a guilty conscience, i.e., so they can do wrong, disobey, sin with impunity.